Virtual reality is an immersive form of digital entertainment that replicates an environment, real or imagined, and simulates a user’s physical presence within it. These experiences also simulate sensory experiences which can include sight, touch and hearing. What is required to experience Virtual Reality? - One or two high-resolution displays similar to ones used in smart phones. Two displays allow for a higher resolution per eye, which is ideal for VR. - A pair of lenses that are used to magnify the image on screen to appear as if it the user is in it. - A gyroscope, magnetometer, and accelerometer, again similar to smartphone technology which detects head rotation so as you turn your head in reality, you turn your head in the virtual world. - Refresh Rate(Hz) – Refers to how many times in a second the screen updates. The higher the better as it makes for a smoother experience and can help prevent motion sickness. - Latency – Refers to the time between your input (head movement) to the output (screen display). While this is influenced by a mixture of technologies and not just the headset, it is an important factor nonetheless that will determine the immersion of the experience and prevent motion sickness. - Stereoscopic Images - Virtual reality content is often displayed in a dual image format to simulate the left and right eye. This is done in order to simulate depth – similar to 3D movies to give the objects you are looking at on screen more of a physical presence. - FOV – field of view. A higher field of view results in a more immersive experience similar to reality. - Distortion – With magnification of the image comes distortion along the curvature of the lenses. Software is used to correct distortion caused by lenses. - Mobile HMDs – using smartphones to power the VR experience. Normally with a separate case and lenses. This is the most accessible of all VR technologies given the ease of use and general cost. - Tethered HMDs – powered by powerful machines such as PCs and consoles. Takes advantage of high performance graphics and processing. Offers experiences that are far superior and immersive, but require a high powered machine to operate. - Augmented Reality HMDs – Unlike VR HMDs which are entirely closed off, AR HMDs allow the users to see the real world through a front facing capture device, while overlaying a digital interface over it – bringing virtual elements into the real world. - Mixed Reality HMDs – HMDs that combine VR and AR experiences. Controllers help you interact with the virtual world. As the VR industry is growing, there are several types of controllers used to interact with virtual content. - Standard Gamepads: Similar to controllers used for the Playstation or Xbox, gamepads can be used to interact with virtual reality. While not the most immersive solution, they allow control for movement and interaction in a format that most gamers are familiar with. - Motion Controllers: Arguably the most favoured form of VR controllers. They usually come in the form of twin controllers (one for each hand) and offer interactive buttons and input, while being able to track the physical movement of a user’s hands in all directions, allowing for an enhanced feeling of physical presence in the game. Motion controllers can also come in the form of gloves or cameras that track the movement of your hands. - Locomotive Controllers: Locomotive controllers help simulate movement in the virtual world. While standard controllers and motion controllers can do this, locomotive controllers actually simulate walking/running. Locomotive controllers can come in the form of omnidirectional treadmills –treadmills that allow the user to walk endlessly in any direction they want, or chairs that allow control for movement by leaning in different directions to name a few. - Other Technologies: There are other controller technologies being experimented with such as eye tracking – allowing users to interact with objects just by looking at them, or haptic feedback controllers, which allow simulation of touch in the virtual world. The VR industry is new and still growing, so this list should continue to grow as more companies innovate around the technology. *While tracking cameras help improve immersion for VR they are not always necessary. Tracking cameras help track the user’s position in the virtual space. This can range from leaning in different directions with your head to being able to walk around in a limited space. - Positional Tracking Cameras: Most Virtual Reality HMDs come packaged with basic positional tracking cameras. These cameras are placed in front of the user and allow the user to lean in all directions in combination to basic movement (VR controllers) and head rotation (HMD) providing enhanced sense of presence and immersion. This allows you to lean forward to examine objects more closely, and makes for a more immersive experience by adding depth. - Room Scale Tracking Cameras: These cameras are mounted above users in a fixed space, typically a few square meters large. In addition to tracking leaning in all directions like basic positional tracking cameras, they also are able to track movement within the entire space, allowing users to walk around in the VR world without extra controller input. This, combined with motion controllers, represents the most natural way of interacting with virtual worlds to date – with the controllers tracking hand movement and the room scale tracking cameras translating your physical movement in real life to virtual reality. It provides for the ultimate sense of immersion and presence. Content (entertainment and games) need to be created with Virtual Reality in mind in order to make full use of the various technologies outlined above. Factors required to make content VR enabled: - Compatibility with Display technologies: VR content must be displayed in stereoscopic format. This is one of the requirements for content to be considered virtual reality content. - Compatibility with Controllers and Positional tracking technology: The content must be developed to work with the various controllers highlighted above. - Availability of Emulators: There are emulators available that make standard content today VR compatible. These emulators have to be supported by the VR platform you decide to use. Content will also need to be actively supported by the emulator. - Designed for VR: Created from the ground up to provide users with the most immersive VR experiences possible. Optimized for motion controller and HMD technology. - VR-Ready Content: VR-Ready content can be existing content that has been made compatible with VR technology. While still offering an immersive experience than standard formats they might not be as well optimized in terms of game and level design. What do I need to run Virtual Reality hardware? This depends on the type of HMD you want to use. Mobile HMDs are most typically powered by smartphones unless they come with a built in device. There are Mobile HMDs that only allow the use of smartphones of the same brand, and there are Mobile HMDs that allow you to use a wide range of smartphones. As these are mainly powered by Android, you can gain access to VR content supporting smartphones on Google Play. Tethered HMDs will require high powered machines to run. While system requirements vary depending on the specifications of the headset , and how intensive the content you are running is, in general a high end computer system is required to run the hardware (as of May 2016 this would be PCs powered with at least a GTX 970 or equivalent, with at least i5-4590 equivalent, and 8gm of ram). A high end machine is required in order to render content in the stereoscopic format for use with VR headsets. Rendering content twice requires more processing power than it takes to render normal games and experiences. 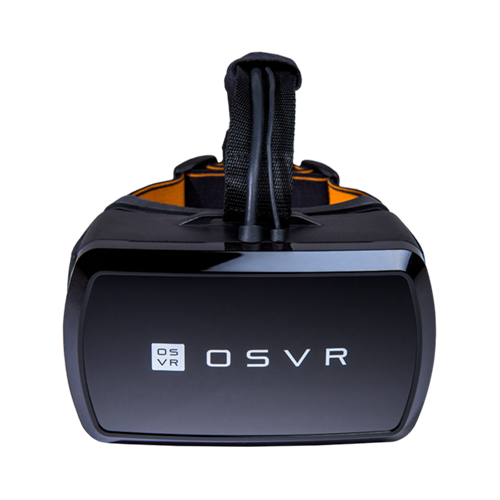 There are some HMDs like the OSVR HDK 1 that are designed to allow users to run it on a mid-tiered gaming PC and better. OSVR or Open Source Virtual Reality is a software platform that allows different types of VR technologies to reside on the same ecosystem. This means end to end compatibility across different brands and devices, allowing you to use any OSVR supported HMDs, controllers and other technologies together, giving you the ability to customize the combination of hardware you’d like to use. Think of OSVR as a software that allows you to customize your VR rig the same way you can customize your PC. When buying a PC it doesn’t matter what brand of monitor, printer, keyboard, graphics card or CPU you want to use – they all work together, allowing you to get a truly customized experience. This is what OSVR is driving for the VR industry and to date it is the world’s most supported open VR ecosystem. It puts the power of choice in your hands. In the case of OSVR, a core part of our software’s technology is its being open source. That means anyone has the power to contribute to it and use it without fear of control or restrictions. Everyone can use the software in way that helps their technologies – to support it, and improve VR technology as a whole. The freedom allows innovators to bring you more advanced products and technologies. Being an open ecosystem also means that it is non-biased and supports all technologies that support the ecosystem equally. VR is a new industry, and in order to truly reach its potential, equal opportunity needs to be made available to all the companies in the world rallying to support it. That means unrestricted access to hardware, content and new technologies that will help the industry as a whole. We currently have over 320 (and counting, as of May 2016) official supporters contributing to the ecosystem in some form or the other, including companies like Intel, NVIDIA, Acer, Ubisoft, Gearbox Software and Legendary Studios. We also have VR dedicated partners like Leap Motion, Nod Labs, Perception Neuron, Jaunt and the like. In general, we have 20 HMDs on their way to being supported, 4 to 5 different controllers, and over 150 content developers producing games, cinematic content experiences and simulations. We are growing the ecosystem on a daily basis to broaden your content and hardware choices. Is OSVR the same as Oculus? No. OSVR is open source while the Oculus platform is closed. This means that the hardware offerings and content available on the Oculus platform is proprietary and limited to within the brand itself. The OSVR ecosystem on the other is made up of different technologies from different brands. The HDK or Hacker Development Kit is a virtual reality HMD designed to bring the benefits of the OSVR ecosystem to fans of VR out of the box. Not only does it allow you to experience VR, its support for the OSVR ecosystem means access to the growing range of VR controllers and technologies that support the ecosystem. - HDK 1 – Designed to provide all the essential technology you need to experience VR. - HDK 2 – Designed to deliver mind bending visual experiences with more advanced technology. Why is it called a Hacker Development Kit? Is it for developers or consumers? It is primarily for developers and enthusiasts. The HDK was designed to embody the vision of the software platform – to allow for unrestricted innovation for developers. It was created to address the needs of the emerging VR industry that requires flexibility and technology that is open to evolution. This to help power innovation and allow owners of the hardware to access the latest technologies as soon as they are supported by the ecosystem. That being said - we are looking into simplifying the setup process so that consumers too can take advantage of what it has to offer. What content is available for the HDK? What are the system requirements for the HDK? - HDK 2 – A PC running at least a GTX 970 and i5 4590 or equivalent with a minimum of 8GB of Ram. *Optimal performance comes down to the system requirements for the content you are running. Where do I purchase the HDK? What types of content can I run on the HDK or OSVR compatible HMDs? Being open source, we work with the community on providing access to other VR content platforms to add variety and flexibility to your content options. This includes SteamVR, emulators like Vireio Perception, and more. Where can I download OSVR supported content? Does OSVR only support games? OSVR is designed to support a wide variety of content from games and cinematic content to simulations, and marketing and advertising projects. Can I play Oculus or HTC Vive content on the HDK and OSVR compatible HMDs? We support Vive content through SteamVR. SteamVR is a platform that developers use to support the HTC Vive and through our plugin, their content will also be available on the OSVR ecosystem. The Vive uses Room Scale tracking technology and motion controllers that are not yet available on the OSVR ecosystem. We strongly encourage you to try out SteamVR content that can be played with basic gamepad controllers. Can my Oculus Rift or HTC Vive run OSVR content? Not at the moment, but we are working on opportunities to make this happen. Does OSVR have a content store? Due to the nature of our platform, we leave developers to decide where they would like to make their content available and how much they’d like to charge. Our content hub serves as a central point through which we will point out to the individual distribution platforms chosen by the developers. I’m having trouble running my OSVR content. Need help setting up the HDK? You can refer to the set up guide that is included in your HDK’s packaging. Alternatively, you can contact our support staff at http://www.razersupport.com/hdk1 and file a ticket under “General Support”. What are the minimum system requirements for the OSVR Hacker Development Kit? The Hacker Development Kit has been designed to balance quality with system requirements. As such any mid range gaming pc onwards should be able to run it. Do note however that the quality of your experience ultimately depends on the system requirements of individual VR experiences as some might be more demanding than others for ideal performance. I’m having trouble getting the ideal fit for my HDK. The HDK has got 2 main straps. Side straps and an overhead strap. In order to ensure the HDK sits well on your face to avoid discomfort to the nose and cheekbones, the overhead strap needs to be adjusted so the weight resting on your cheekbones is at an ideal comfort level. If the cable running along the overhead strap is too short you can pull it through the rear IR box carefully for more length. The side straps should be tightened to the point where you can move your head quickly from left to right without the HDK moving. If the straps are too loose there can be a perceived latency. How do I adjust the focus on the OSVR Hacker Development Kit? The focal adjustments on the OSVR Hacker Development kit are used to cater to individuals who are long or short sighted between +450 degrees to -200 degrees. In the event this level of adjustment is outside the range of your eyesight, you can try wearing glasses or contact lenses. To avoid damaging your glasses, it is recommended you loosen the straps on the HDK to accommodate it. - Potential to scratch the lenses. Why is the HDK’s Belt Box important? Usage of the belt box will result in optimal cable management to avoid accidental tripping, potential damage to cables due to pull and strain and unintended disconnection during your VR experience. The belt box should either be attached to your pants or a stable surface to ensure it is secure. My IR Positional Tracking Camera is not working. For best use of your IR positional tracking camera ensure that the HDK is within line of sight and no more than 3 meters away. If you need additional assistance you can contact our support staff at http://www.razersupport.com/hdk1 and file a ticket under “General Support”. The bamboo charcoal microfiber facemask can be rinsed quickly with cold water if it gets dirty. It is not recommended to wash them with hot water as the heat might split the glue in the specialized microfiber foam layer. The facemask is attached by Velcro and is replaceable. You can purchase additional facemasks once they become available on http://www.osvr.org. A microfiber cloth is provided with the HDK to allow for gentle cleaning of the lens surface. Avoid using non-microfiber cloth as this can result in hairline scratches. An air puffer is also provided to remove dust caught in between the lenses and the display. The display on my OSVR Hacker Development Kit is not working. If the display on your HDK or any other aspect of the hardware is not working, a basic power cycle should help resolve the issue. Direct mode is a feature that allows all PCs using VR ready GPUs to automatically play content on the VR headset without having to go through the regular windows display configuration. It also improves performance. Some games support direct mode and some don’t. If the game does not support direct mode you will have to toggle direct mode off by going to the Windows search bar and typing in either “Disable DirectMode”. You can enable direct mode again by “Enable DirectMode”. Ensure that your graphics card drivers are fully updated. If you need additional assistance, you can contact our support staff at http://www.razersupport.com/hdk1 and file a ticket under “General Support”. The latency on my OSVR Hacker Development Kit is high. Latency refers to the time in which a display responds with regards to movement of your head. It is key to a great VR experience. High latency or lag can result in motion sickness. i. Check if you are running the latest version of OSVR server. Update if necessary. ii. Check your PC Performance. Running a VR game can be very resource intensive. If its minimum requirements are not met, it can result in bad performance. Try to close other applications that may be using your computer’s resources. I’m suffering from motion sickness, what do I do? If you are still suffering from motion sickness you can try moving your head less and avoiding sudden jerky movements. Fatigue or tiredness can also induce motion sickness. If this still persists, stop using the headset. If after a period of time you still feel unwell, please see a qualified medical practitioner for help. The OSVR Hacker Development Kit has got 2 main straps. Side straps and an overhead strap. In order to ensure the OSVR Hacker Development Kit sits well on your face to avoid discomfort to the nose and cheekbones, the overhead strap needs to be adjusted so the weight resting on your cheekbones is at an ideal comfort level. How do I use the focal adjusters on the OSVR Hacker Development Kit? The focal adjusters on the OSVR Hacker Development kit are used to cater to individuals who are long or short sighted between +450 degrees to -200 degrees. In the event this level of adjustment is outside the range of your eyesight, you can try using glasses. To avoid damaging your glasses it is recommended you loosen the straps on the OSVR Hacker Development Kit to accommodate it. -Potential to scratch the lenses. Why is the OSVR Hacker Development Kit’s Belt Box important? I need general hardware and software support. Please visit http://www.razersupport.com/hdk1 and file a ticket under “General Support”. What are the warranty terms for the HDK? Please visit http://www.razerzone.com/warranty for more details on the HDK’s warranty policies. I’m having trouble running my OSVR content running. For best use of your IR positional tracking camera ensure that it is within line of sight of the OSVR Hacker Development Kit and no more than 3 meters away. In general if the display on your OSVR Hacker Development Kit or any other aspect of the hardware is not working a basic power cycle should help to resolve the issue. Direct mode is a feature that allows all PCs using Nvidia cards to automatically treat the VR headset as a secondary display without having to go through windows display configuration. It also improves performance. Some games support direct mode and some don’t. If the game does not support direct mode you will have to toggle direct mode on and off via Razer Synapse. If support for direct mode is not clearly indicated for the game we suggest playing with this toggle to troubleshoot. Lastly, check if the windows display driver is installed correctly under “Device Manager”. Reinstall it if necessary. Latency refers to the speed at which a display refreshes to keep up with the constant movement of your head. It is key to a great VR experience. Low latency or “lag” can result in motion sickness. - Check if you are running the latest version of Razer Synapse or OSVR server. Update if necessary. - Check your PC Performance – running a VR game can be very resource intensive. If its minimum requirements are not met, it can result in bad performance. If minimum requirements for the game are met you can try to optimize the performance of your PC through the operating system’s optimization tools or by using 3rd party software (like Razer Cortex) similar to how you would troubleshoot performance for normal games. How do I get an OSVR Hacker Development Kit? Visit www.razerzone.com/store/osvr-hdk to place an order with us. The Hacker Development Kit is currently only available for purchase online through this website. What is the OSVR Hacker Development Kit's return and warranty policy? Details of the return and warranty policy can be found here.